I promised you all an update on our egg carton seed planting project in a couple of weeks. Well, I am very happy to report that after a little over a week, our seeds are sprouting like crazy! I couldn’t wait for two weeks to update you, I had to do it ASAP — check it out!!! The broccoli was the first to show it’s leafy head. There are a bunch of sprouts. These aren’t actually in egg carton containers though, they are in a plastic container that my husband filled with the seedling soil. He sprinkled the seeds in and now we have enough plants for the whole neighborhood. The cucumbers, green onions, and basil are also in that container and doing rather well. The bush beans and bush peas are doing excellent! In fact we’ll probably need to plant them in the ground – or our raised bed – this weekend. Over the past couple of days they have really take off. I think it’s safe to say that we are off to a great start! Are you starting a garden this year? 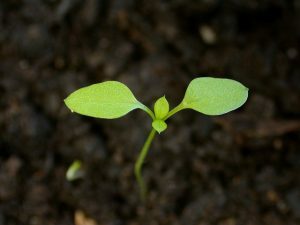 How are your seedlings doing? In the post Spring Fever is Hitting; Time to Plant some Bulbs — I talked about the idea of using an egg carton to start bulbs. Well, I thought that was a fantastic idea and something the boys would really enjoy doing! Every April, my husband and I start thinking about what we will be planting in our garden. We usually go to the store and buy seeds and starter kits. 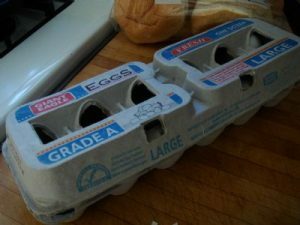 However, I’ve been trying to save egg cartons – since they always make for an easy and fun craft idea for the kids – so we had a few to spare, and decided to see if we could use them to start seeds sprouting. Now — I’m not 100% sure this is going to work, since the starter kits we use are made of plastic but if can work for bulbs, it should work for seeds right? I guess you are going to have to check back to see if things are sprouting or not. I really hope they do, because the boys are so excited!!! We planted bush peas, bush beans, cucumbers, green onions, broccoli, and basil. We did buy seeding starter soil – which was a little more expensive than regular gardening soil – but I figured it might be work the extra $$. We let the boys spoon the soil into the egg cartons and they planted the peas and beans, since those seeds are big and easy for them to handle. The boys added a little more soil after they put the seeds in, then they used a spray bottle to saturate the soil with warm water. After that, I loosely wrapped each carton in plastic wrap and put them in a warm spot. Now we just need to keep an eye on them, keep them wet and as soon as I see some little sprouts we’ll take them out for a little sunshine. Have you ever used egg cartons to start seeds indoors?